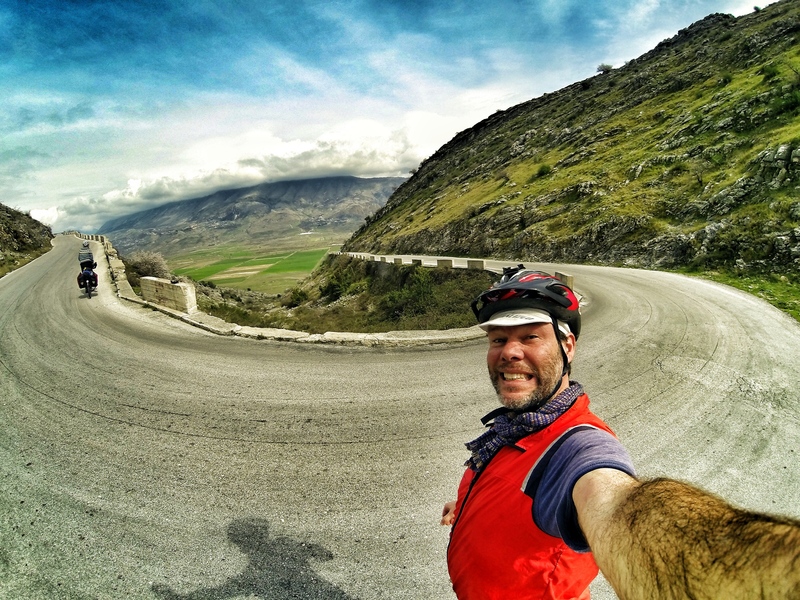 During the last week of February, with spring fever at the door and visas soon to expire, we wrapped up our time at Lake Ohrid, Macedonia and made plans for a 4 day bicycle tour through southern Albania to the seaside town of Sarande. Slowly we began saying our farewells to the friends we’ve made in Ohrid, packing up, looking at maps, and researching routes. After sitting in front of the computer, working on our upcoming book – “Slovenia – a Bicycle Travel Guide” for the past few months we were ecstatic about getting back in the saddle and seeing some new places. 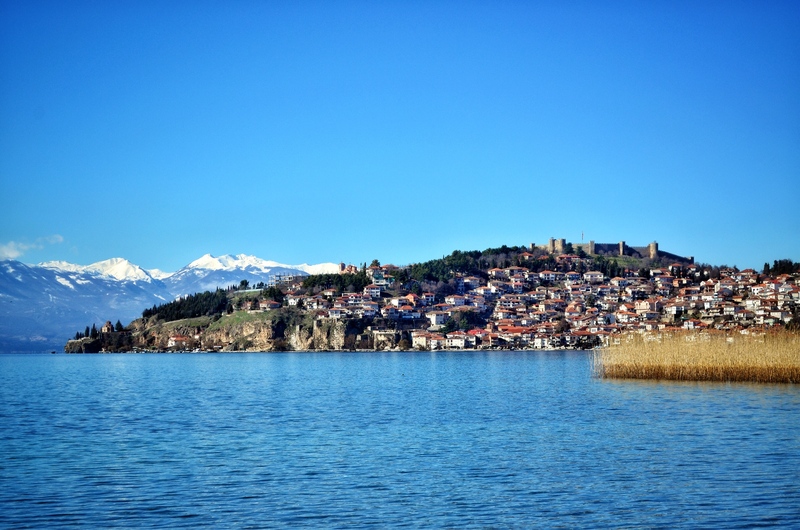 Lake Ohrid, Macedonia. Our winter enclave. 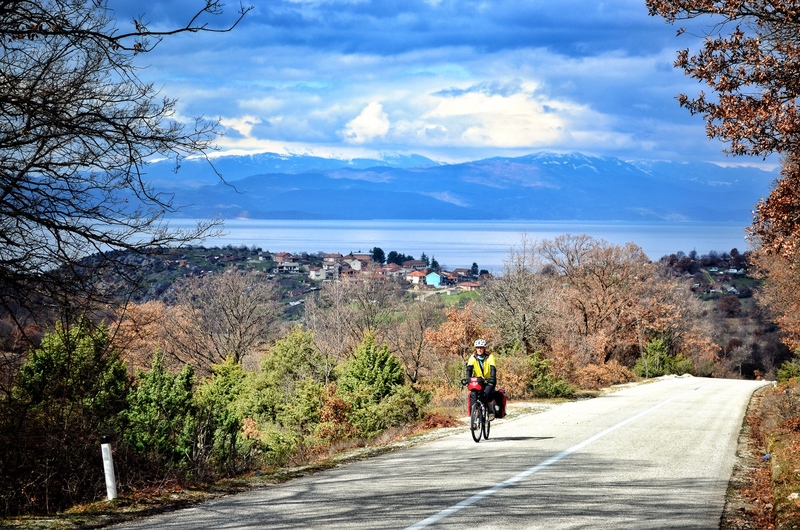 cycling tours Our planned route (GPX): South around Lake Ohrid to Korce then west over the mountains to Farma Sotira, just outside of Leskovik and then north to Gjirokaster and finally stopping at the seaside in Sarande for another extended stay and more writing. 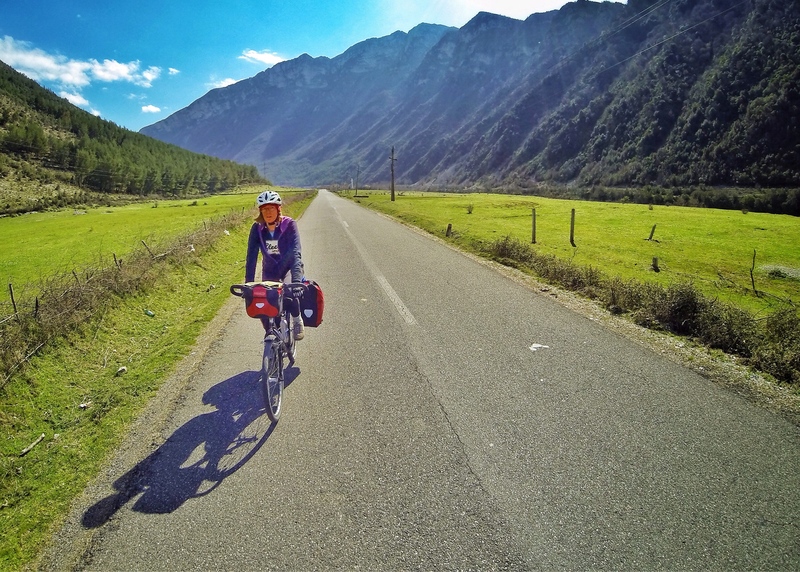 We initially planned 4 days – not taking into account that we hadn’t been cycling regularly for the past few months, the weather (which was about to turn from sunny to blustery), the road quality, and, of course, the mountains between here and the Ionian Sea. Instead of our planned 4 day tour, the route took us 7 days. Stopping the first night in Maliq, just outside of Korce, we stayed with Algent, aWarmshowers host. 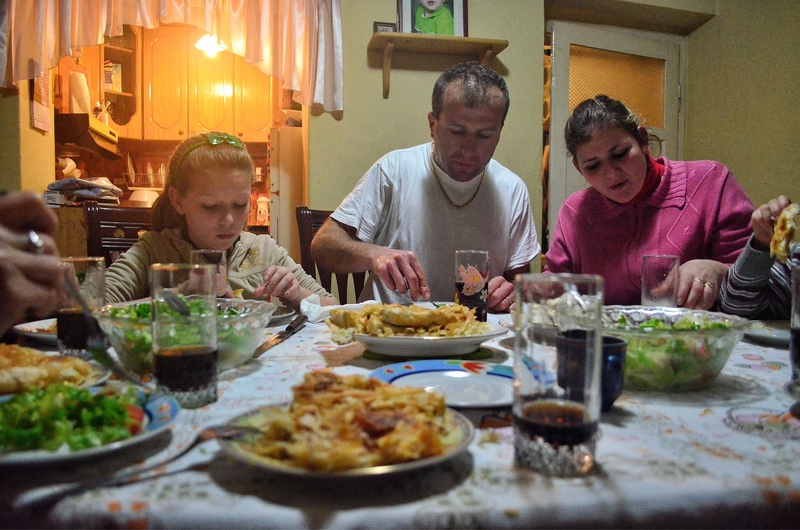 The town’s barber and local bike guru, Algent fed us at his family’s home then put us up for the night in a make shift bedroom at his church. But not before warning us that our planned timetable was too ambitious for the route ahead. 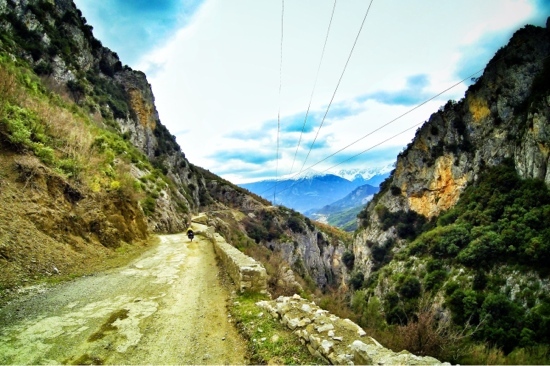 His advice: “Albania’s roads are rougher than we are used to, the weather was going to turn even colder, enjoy the scenery and plan on 6-7 days to reach Sarande.” The next day we quickly discovered Algent knew what he was talking about. Sore from the first day back on a loaded bike after a couple of months and battling increasingly cold weather and rough roads, we struggled on day 2. Feeling tired and cold from the constant wind and drizzle, we stopped in Erseke, a mere 25km from Farma Sotira. C suggested we get a hotel. I didn’t take too much convincing. 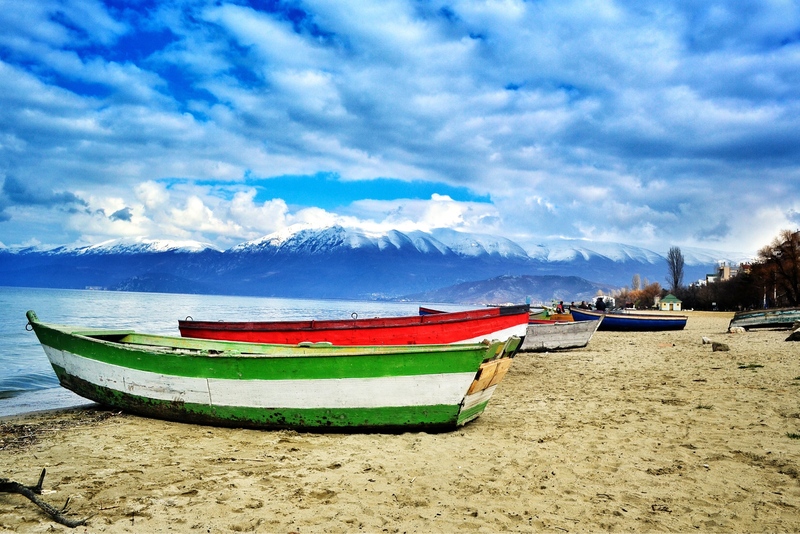 Our first two days in Albania were pretty much as we had expected. The natural scenery was stunning. 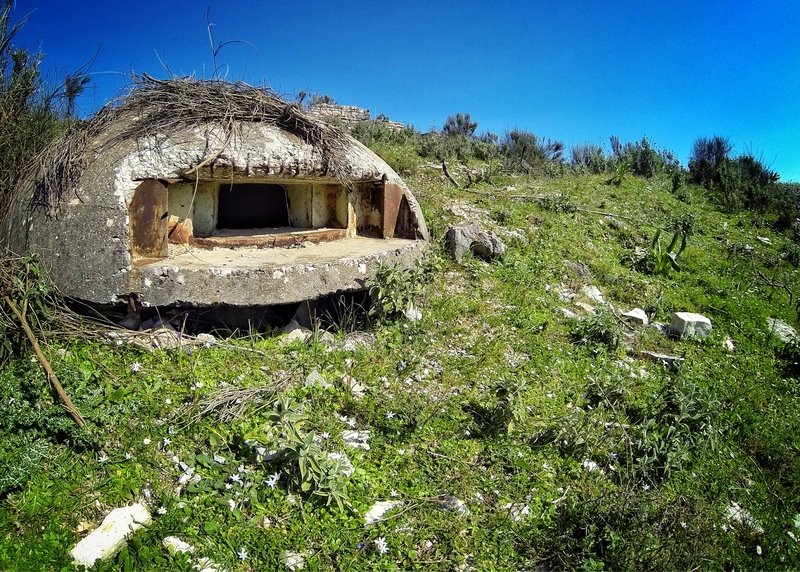 Abandoned gun bunkers of the former communist regime littered the countryside like concrete mushrooms. Roads were beyond rough, although largely absent of cars. Smiling kids came out in droves to slap “high-fives” and shout, “where are you from?” Snarling Shepard dogs chased us, and the outskirts of small towns were awash with piles of garbage and broken buildings. In most small towns we passed through, unemployed men lined the streets. Standing around. Chatting, without much else to do. It was obvious we were the topic of conversation among the loitering crowd. 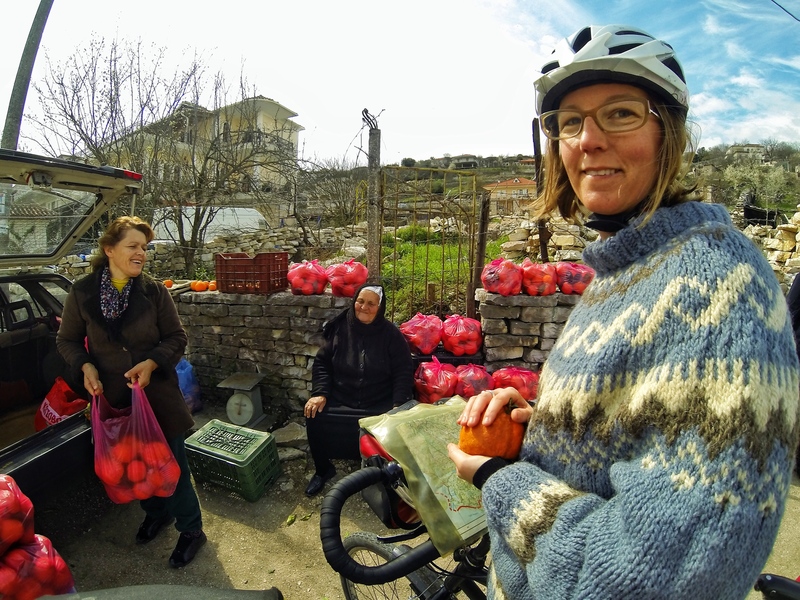 When we did engage the locals, we were always assured, “its safe here, your bikes are safe, you are safe…” Albania’s reputation as a lawless backwater is well known among locals, as well as visitors. Although it didn’t prove to be true, at least in our experience. In fact, in almost every interaction we had with locals, we were welcomed with smiling faces. Buying Oranges along the roadside. The next morning we made the short ride under (finally) sunny skies to Farma Sotira, an organic tourist farm and campground. This was one of our ‘must-stop’ point along this route. Relaxing with a home cooked meal and a warm cabin for the night was sublime. Again, when we proclaimed our stated goal of covering the remaining 120km to Gjirokaster, our host cautioned us to plan on a shorter day. Terrain and road quality being the main obstacles. She was right. 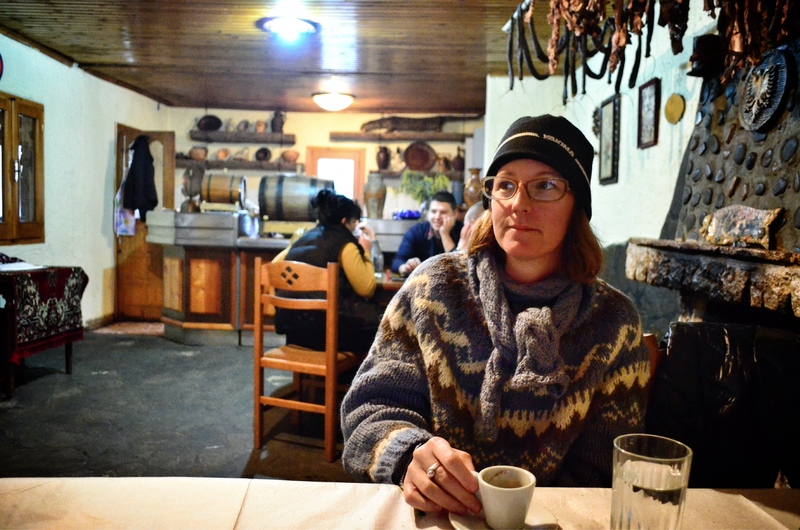 Warming up with Turkish Coffee at Farma Sotira. Starting day 4 with an unrelenting climb to Leskovik, a tiny mountaintop town, complete with the same collection of crumbling buildings, packs of stray dogs and groups of seemingly unoccupied residents standing around town, we pedalled slowly until noon. The descent from Leskovik into the Lumi Vjosa River valley was some of the roughest road we’ve ridden anywhere. The formerly tarmacked, but now pothole riddled, part dirt, part rock “State Highway” followed a steep ravine down from Leskovik to the wide open valley below. The surface was rough enough to snap one of the supports on my rear rack and slow our downhill progress to a crawl. 15 km of descending took us over an hour, but it was not without some stunning natural beauty all around us. The narrow ravine we followed had been carved by a rushing torrent of a river, creating breathtaking twists and turns, as it tumbled downhill. 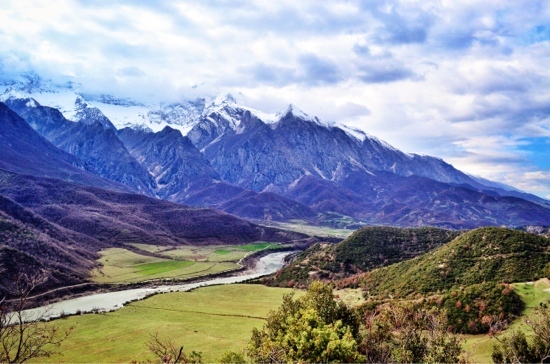 As the enormous valley below began to reveal itself, with snow capped mountains hovering overhead, we turned north along the verdant fields, and herds of grazing sheep to Përmet. The next morning we continued north, cutting westward through a gap in the mountains and covering the remaining 65 km to Gjirokaster in no time. The unpleasant sights of garbage piles and broken buildings of the mountain towns began to fade a bit. The sun was shining, and the roads were smoother and flatter than the previous day’s. Sunny skies and smooth roads. 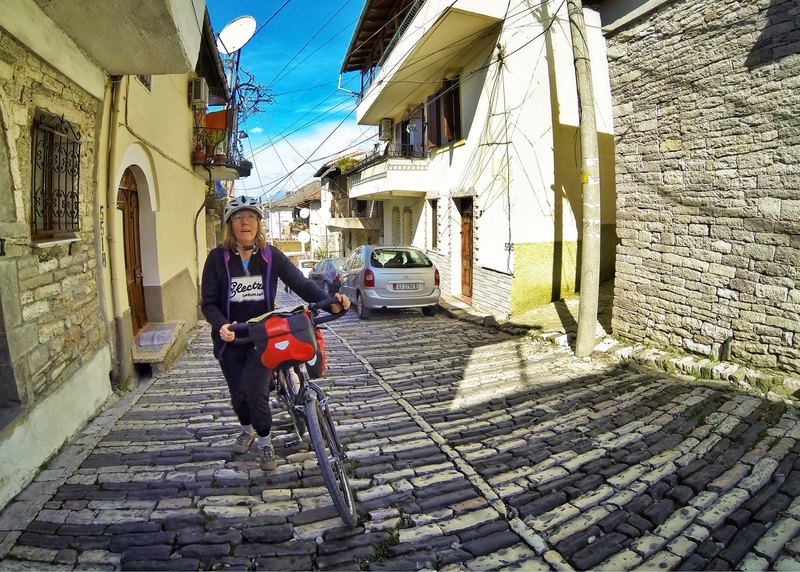 If cycle the valley roads were pleasantly flat, the streets of Gjirokaster made up for it. Steep cobbled lanes leading uphill from the edge of the city to the Old Town had us pushing our loaded bikes for the last 1km. Finally reaching the top, we checked in to Hotel Kalemi for the night. Big, regal rooms, decorated in the style of Albania’s former Pasha ruling class in an old Ottman house, complete with breakfast for 10€. Yes, please.